The rarest iteration of this important map - the Lynchburg Edition. Lloyd's Official Map of the State of Virginia From actual surveys by order of the Executive 1828 and 1859. An extremely scarce map, this is the Lynchburg edition of J. T. Lloyd's important map of Virginia – without a doubt the most influential map of Virginia to be issued during the American Civil War. 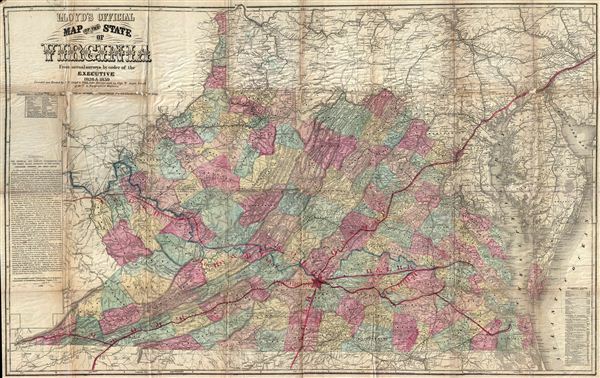 Lloyd's enormous map covers Virginia just prior to the creation of West Virginia later in 1862. Cartographically Lloyd based this map on Herman Boye's seminal large format map of Virginia, of which this is in essence a reduction. Lloyd's original promotion called this map 'the only real good map ever made in America' and, in fact, its size and detail popularized it as military field map during the American Civil War. The Union Generals Winfield Scott and George B. McClellen to plan strategy and the troop deployment throughout Virginia. Though first issued in 1861, Lloyd's Virginia was printed in multiple editions until about 1872, with the present example, known as the Lynchburg edition, being the rarest. The Lynchburg edition was printed not by Lloyd, but rather by Wynkoop & Hallenbeck of 113 Fulton Street, New York, to illustrate an 1872 pamphlet promoting British immigration to Lynchburg. This edition differs from earlier states with regard to its inclusion of revised descriptive text on the left hand side of the map which describe the three geographical zones of Virginia: the Tidewater, the Piedmont, and the Great Valley. Another major difference in the Lynchburg edition, from whence it extracts its name, is the stenciled overprinting indicating the various railroads of Virginia focusing on Lynchburg, identified by a large red star, as a regional hub. The use overprinting, though it does designate a different state of map, also suggest that the original plate was not significantly updated for this printing. Several of the overprinted rail lines, including the R & L, the C & O, and the L & D, are indicated only on the overprint as they had not yet been built when this plate was made in 1862. The only notable update to the original plate is on the imprint, which reads 'Published by Wynkoop & Hallenbeck, No. 113 Fulton Street, New York.' Only the Wynkoop and Hallenbeck edition of this map exhibits the Lynchburg overprinting. Outside of major institutional collections, there are but three known examples of the Lynchburg edition. Wynkoop and Hallenbeck (fl. c. 1850 - 1890) were New York based printers active in the latter half of the 19th century. The firm had its offices at 121 Fulton Street and was founded by Matthew B. Wynkoop (Febuary 16 1830 - March 30 1895) and Harry C. Hallenbeck. Wynkoop was born in Zanesville, Ohio and moved to New York City as a boy where he apprenticed as a printer and engraver. Small scale printing projects and frugal living allowed Wynkoop to open, with partner Hallenbeck, his own publishing firm. For a time the firm also published under the name, Wynkoop, Hallenbeck & Thomas. Little is known regarding Wynkoops partners, Hallenbeck and, for a time, Thomas, however, as a group they were not focused on maps and their cartographic corpus is small. Good. This map, like all known examples of the 'Lynchburg edition' exhibits overall toning, some loss, and wear on the to the original fold lines. Example has been repaired on the verso using reversible conservators tapes and glues, however, would benefit from additional professional flattening and repair work, which we leave to the discernment of the buyer. Rumsey 3814.001. Library of Congress, Map Division, G3880 1861 .L41 Fil 77. Stephenson, R. W., Civil War Maps; an Annotated List of Maps and Atlases in Map Collections of the Library of Congress, 465. Sames, J. W., and Woods, L. C., Index of Kentucky & Virginia Maps, 1562-1900, p. 211. Phillips (America), p. 988. Phillips (Virginia) p. 72.